experienced gardeners looking to hone their craft. Anyone still reading at this site, and not yet over at smallgardennews.com, my new site, may not be aware that my little book finally got published. I am so happy to have finished! There is more, of course, even though it is just a little book (65 pages) but those are the main sections. I developed the book with gardeners in the Southeastern U.S. in mind - from the Carolinas to East Texas, in planting zones 7, 8, and 9. 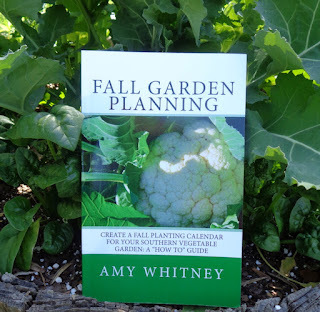 I wrote it because, when I worked at my county's Cooperative Extension office, a fairly common set of questions each year was about when to plant and what to plant for a fall vegetable garden. This book is my expanded answer to those questions, based on my experiences as a long-time organic gardener who looks for research-based answers to questions. If you choose the Kindle version, you might want a larger copy of the blank planting schedule that is in the book. I have added a FREE pdf version that you can download as an 8.5x11-inch copy to the Books page at Small Garden News. It is near the bottom of the page. 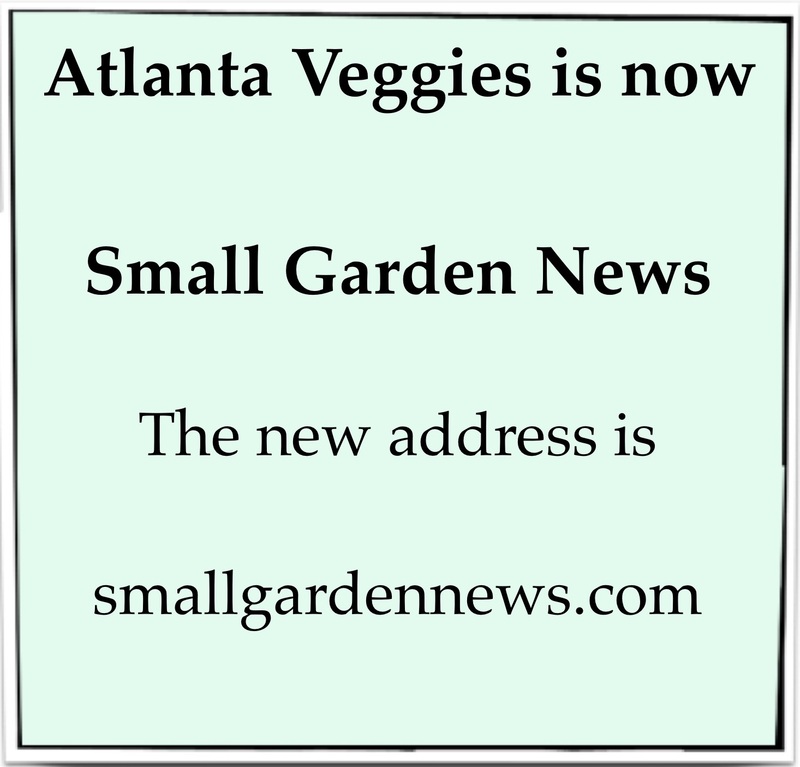 I've added links, in the sidebar to the right, to the newest blog posts that are up at Small Garden News. 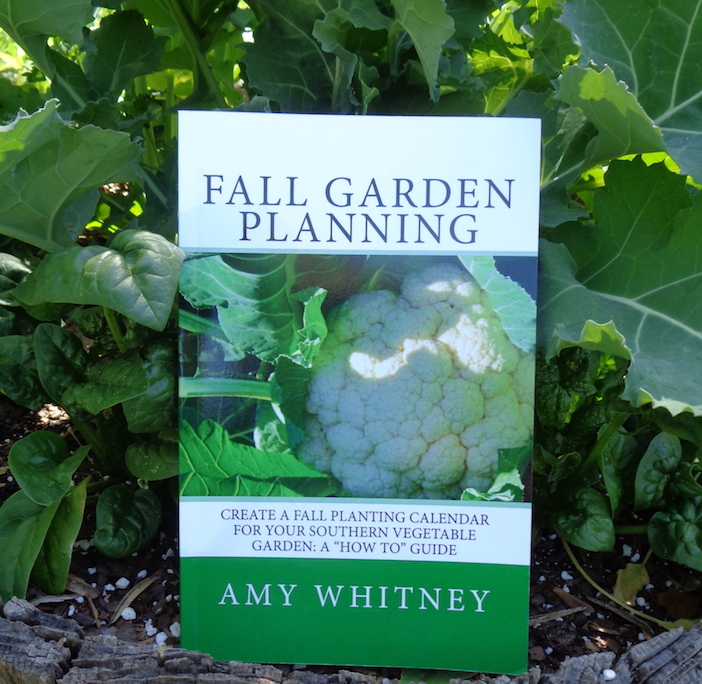 I've also been working on a booklet, to actually be published and for sale at places like Amazon.com, about Fall Garden Planning. This is a part of gardening that some newer Southern gardeners struggle with. The goal of the booklet, which is only 30 pages long, is to help gardeners choose appropriate crops for a fall garden and set a planting schedule based on the varieties chosen and a best-guess for a first frost date in fall. Some of my gardening friends are reading it now, to let me know what needs to be added or changed. Have I ever said here how much I appreciate the Master Gardener volunteers in my county? They are always supportive of my garden-related projects, even when the projects are a bit off-the-wall, and willing to help when needed. A couple of MGs are among my readers. I have a new post up at Small Garden News. The post is Snowfall, Gardening, and Community. The post is about our snowy adventure here in the North Metro area. Atlanta ended up with a few inches of snow, but we got close to a foot. It has been more than a week since the big snowfall, but we still have snow on the north side of our roof! There are several reasons why I am (slowly) shifting over to a new website. One is that leaving comments on this blog, which is hosted by Blogger, can be complicated (and frustrating); I have spoken with people who have given up after several attempts. The WordPress comments feature for blog posts at Small Garden News may be easier to use. In addition, that site has a Contact form, that actually works, for sending me questions or updates about your garden. I am not working at the Cooperative Extension office anymore, but I still am happy to work with other gardeners to help their vegetable gardens! This past week I made a little video about the components needed for making vermicompost at home. 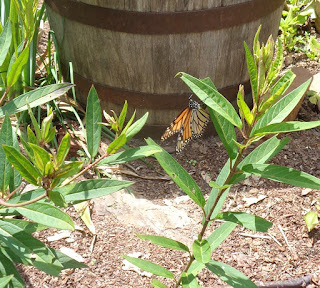 The video is linked on the worm composting page of my new site, Small Garden News. It took several tries to make a video that is acceptable, and my whole bin of worms got dumped and re-set several times as I worked out what to say and what to leave out. By the time the final version of the video was done, my worms were probably in shock. The video ended up with a lot of information in it (my nerdiness shines through the whole thing). It is about the five main parts of a worm farm and why they are important, but it does not include everything you need to know to harvest a bin like mine. To be honest, a purchased worm composting system of stacked trays, with a spigot for draining off extra fluid, is easier to manage, but not everyone wants to spend that much money on a new activity. Also, it can be good to start with a small DIY bin to learn whether worm composting is something you are really interested in. Just like with gardening, starting small makes the learning curve a little easier to climb. At some point in the future, more information will be added to the worm composting page. Until then, you can ask questions either by leaving them in the comments section of this blog post or using the contact form on the Small Garden News site to email me a question. I didn't grow up with gardening. I always loved to be out-of-doors, and I loved plants. When I went to college, still loving plants, I studied botany. All through my adult life, I have been lucky enough to encounter wonderful books about plants and gardening that have helped me along the way. Some of these books were not strictly "how to" books. When they were, they tended to be for regions of the country (or the world) that have very different conditions than where I live, so the instructions don't 100% work in my yard. 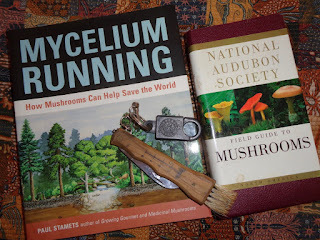 Instead of using them as instruction manuals, as I found them and absorbed what they had to offer, these books engaged my imagination, made me laugh, and showed me new ways of viewing gardening and plants. Culinary and Salad Herbs: Their cultivation and food values with recipes, by Eleanour Sinclair Rohde. 1972, Dover. A republication of the original 1940 book published by Country Life Ltd, London, England. My Great Uncle Balfour, a man I had met only a few times in my childhood, lived in the same town where I was in college. One day, when I had walked across town to visit and share a pot of his Darjeeling tea, he gave me this book. He was going blind from macular degeneration and could no longer read, but he loved plants, too. When his sight had begun to fail, using information from this book, he had replanted most of his garden with herbs. He didn't need to see the herbs to find the right ones for use in the kitchen. Scent was all the guide he needed. 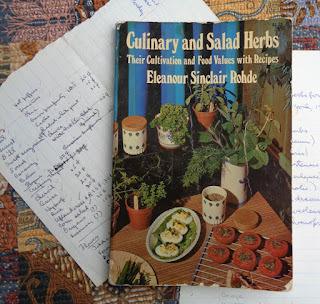 Folded into the book are a couple of sheets of paper, with handwritten notes about the herbs in Uncle Balfour's garden. One sheet contains a seed list. In 1974, he paid 15 cents for a packet of sweet marjoram seeds. "James II's head cook considered that there should be at least thirty-two ingredients, and a 'brave sallet' contained more than that, for it was the decorative centerpiece of the table." For someone whose experience of salad had, up to then, consisted of iceberg lettuce combined with bits of carrot and tomato, topped with some Green Goddess dressing, this requirement strained the brain. However, the rest of the book helped me see possibilities for the other 29 ingredients. This is the very first gardening book I ever read, and it shone a light on my path forward into both gardening and using my own herbs and vegetables in the kitchen. Anyone else, new to gardening and loving plants, could do worse than to start with a regionally-inappropriate little book like this one. Woke up this morning to a light frost in the yard -- the first frost of the year for my yard. My mom texted me yesterday that a freeze warning for my area had popped up on her phone, so the frost was not a huge surprise. Also, we are at the end of October, which is a usual time for a first frost in my yard. When I visited my mom and stepdad in Oklahoma a couple of weeks ago, I carried a lot of her tender potted plants into her sunroom, knowing that cold weather would soon be there, too. Mom used to have a lot more begonias, but now at least half of the potted plants are Bromeliads. All of hers have toothed edges like saw-blades, so the sister who would have had to carry those in was really happy that I was there to help. She had someone to share the scratches and scrapes with! In my yard, there are no potted plants for me to carry indoors, and there are few frost-tender plants in the garden to worry about. 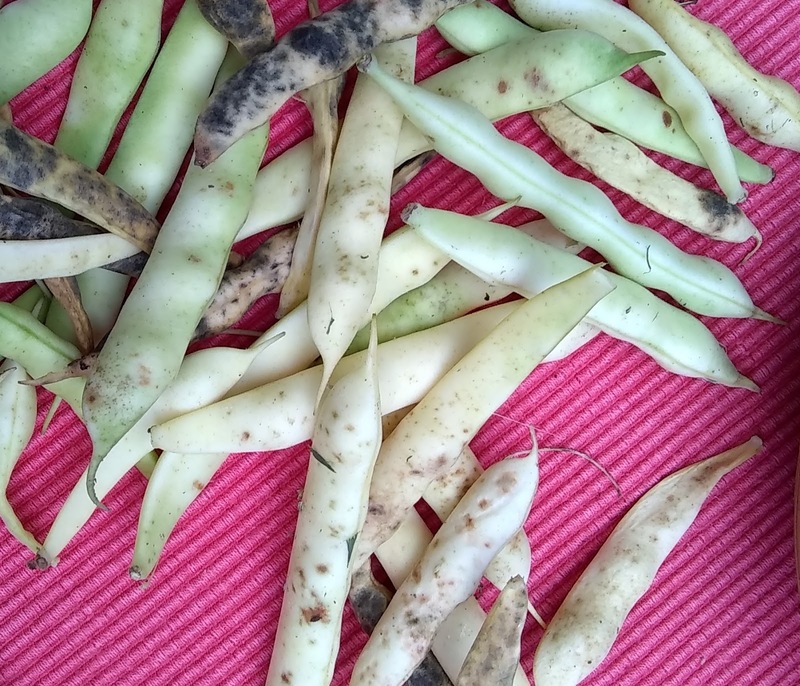 The leaves on the bush beans look pretty rough this morning-- darkened and wilted -- but they already had finished producing beans for the season. Cool-season crops that had been planted with winter in mind look just fine. Frost bowed some of the leaves early, but as the day warmed, the leaves all perked back up. I checked the radish section of the garden closely, looking for signs that the roots are beginning to expand. All the salad radish roots are looking good and will be ready to pull over the next couple of weeks. It may be awhile before the winter radishes are big enough to pull, though. Most of them still have that thickened-stem look, instead of being round roots. This weather also signals that the time for planting garlic and shallots is at hand. If you are not prepared, with garlic and shallots ready to plant right this second, that is ok, because the window for planting these is large. Some years, I don't get the garlic planted until January, and the crop still comes out fine. After eating beans for a few weeks from my early August planting of Aunt Joanie beans, I have let the rest of the bean pods mature on the plants. 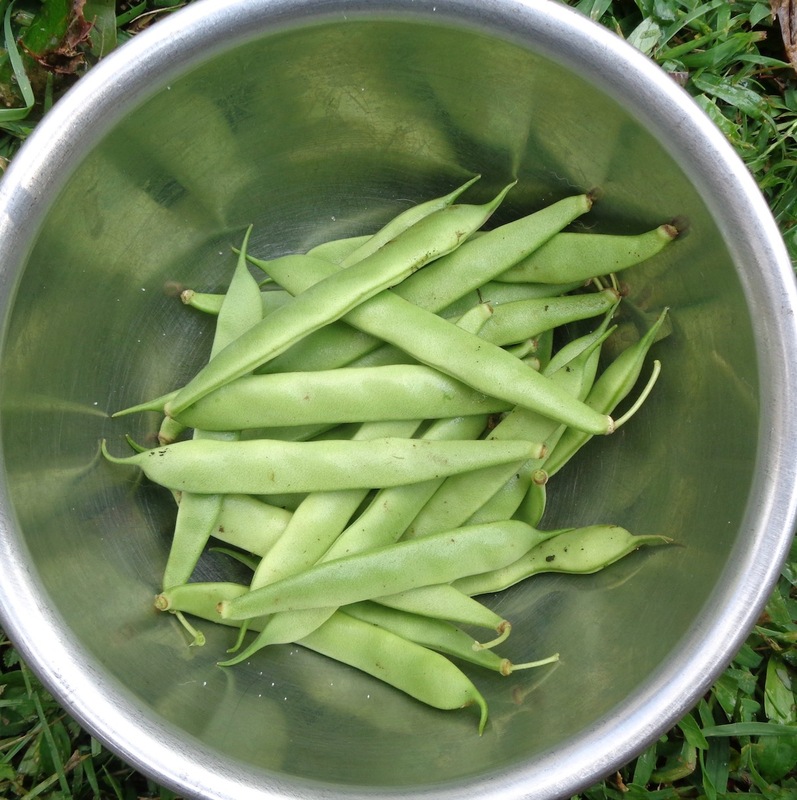 The ripe (old, pale, tough) pods are not good to eat, but the beans are good to save for planting next year. Beans for seed-saving need to be fully developed, which means they are at the stage when you might use them as dry beans in the kitchen. In drier climates, mature bean pods can be left on the plants until they are "rattle dry". The pods will be brown and brittle and easy to shell out. 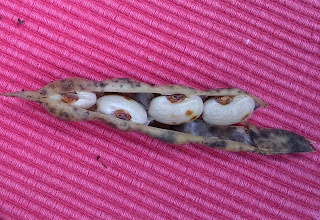 Here in the Southeastern US, we are not having the kind of dry weather that allows for bean pods to dry to brittleness. Instead, we are having the kind of humidity and rain that encourages mildews and fungi. That means I am shelling out leathery pods, not brittle ones, and the beans still are plump with moisture. Also, some of the pods are mildewed. When I shell out the mildewed pods and find unblemished bean seeds, then those beans can be saved for seeds. I don't save seeds that look infected or damaged, because I don't want to have my whole next crop be ruined by a fungus. I also don't save seeds from pods that contain fewer than three seeds inside. I don't want to encourage plants that produce puny bean pods, and I am pretty sure that if I saved seeds from a lot of short pods, soon enough my entire crop would mostly have short pods. 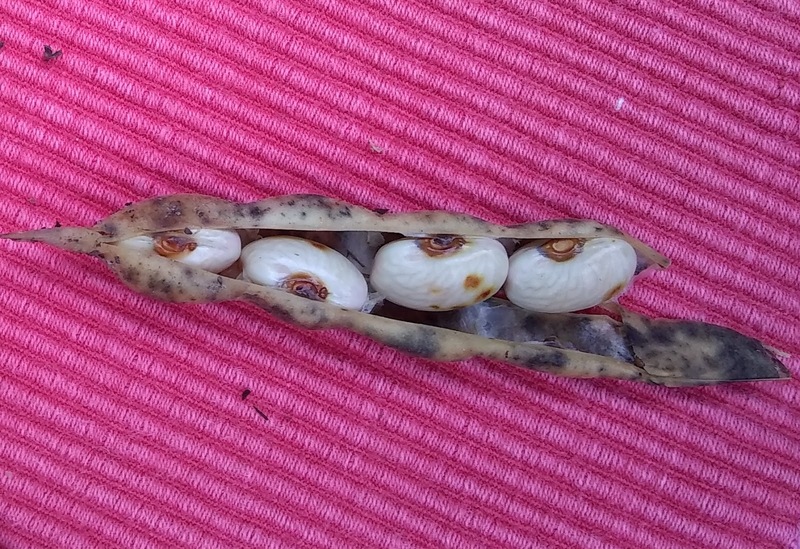 Before storing the bean seeds for planting in another season, they need to be very dry. I leave the seed beans out on the counter to dry for several days (or more) until they are so dry that one hit by a hammer shatters instead of smashes. As they dry, these beans will get smaller, and they also will turn to a gentle tan color. They really are beautiful beans! 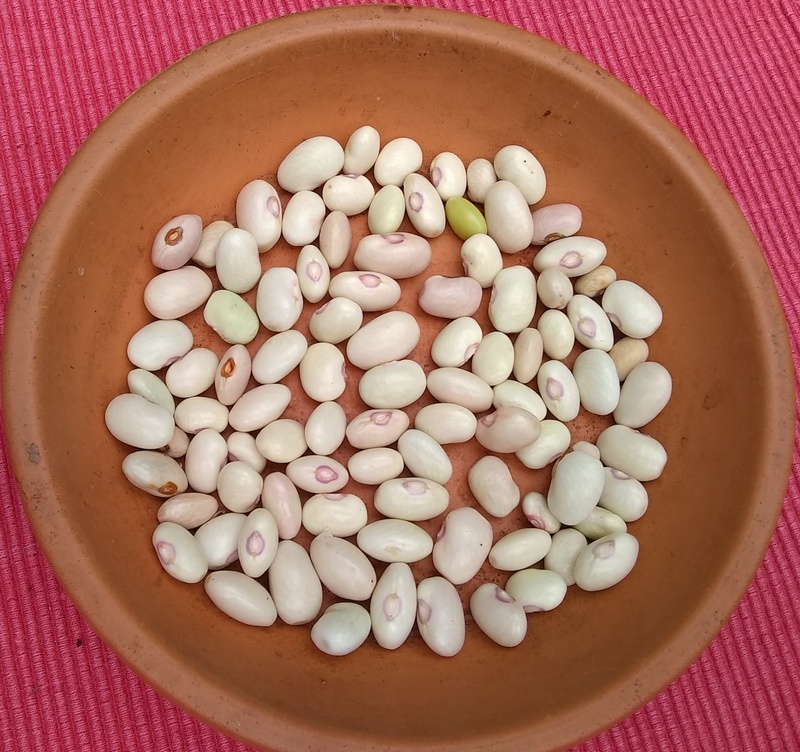 When the seed-beans are very dry, I will make an envelope for them, label with the season they were grown in (Joanie Beans, Aug-Oct 2017), then store them in one of my airtight containers in the fridge. Next year, or even five or six or more years from now, these seeds will still be good for planting. "Baker Creek Heirloom Seed Company may be located on a small farm near a small town in rural Missouri, but we are neither uninformed nor complacent about the devastation caused by the recent hurricanes in other parts of the world. Our hearts go out to those who have lost everything except their lives, and our hearts go out to the families of those who actually did lose their lives. We want to do more and we want you to help us do more. Many of these people need IMMEDIATE assistance of food, water, and medicine. It takes MONEY to get those things to them. In an effort to get that immediate aid to those who need it, Baker Creek is running a special for an entire week in which we will donate 100% of the seed sales to World Help, who will distribute supplies to Puerto Rico and other areas damaged by these horrific hurricanes. All sales proceeds from all orders placed today, September 29, through next Friday, October 6, will be donated to World Help to help them move in food, water, medicine, and other needed supplies. We also are donating home garden restart kits to any individual or family who has lost their gardens to these horrific storms. If you or someone you know has lost a garden in the hurricane and could use a start up seed kit, please send your story and contact information to seeds@rareseeds.com and to the attention of “donation” so that we can send you a starter kit." I keep a close watch on hurricanes. I have a son in south Georgia, a niece and her family in Florida, a sister and her family in Louisiana, and two brothers and their families south of Houston, TX. The brothers were part of the mandatory evacuations, but my people all made it through the recent storms without serious mishaps. As we all know, and the Gettle family of Baker Creek Seeds is also aware, lots of people were less fortunate. If you need seeds and are able to purchase some through Baker Creek in the coming week, 100% of the proceeds will go toward hurricane relief efforts. If you know people whose gardens may have been damaged or destroyed in this year's hurricanes, or whose stored seeds have likely been damaged or destroyed by heat or water, please tell them about this very kind offer from Baker Creek. I planted a little patch (about 2 x 3 feet) of heirloom Aunt Joanie Beans in the first week of August, and today I harvested the first beans from that patch. That puts the days-to-maturity (or days-to-harvest) at about 50 days for this variety of beans. There are not many vegetable crops that can be brought to the kitchen so quickly! 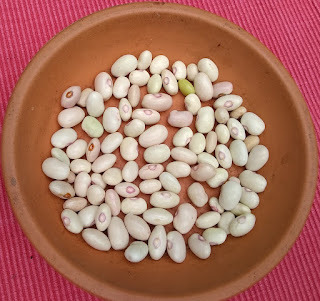 First harvest of Joanie Beans from an early August planting. This first day's harvest is not enormous, I know, but after I washed and snapped the beans you can see in the picture, they measured a little more than a cup and a half. That is enough for two people to enjoy at suppertime. If there were more of us here to split the harvest with, I would tuck these into the fridge and keep adding more each day until there were enough saved up. The little plants have many more beans and flowers on them, at various stages of development, so more beans are definitely on the way! By tomorrow, an amount of beans similar to what I brought in today should be ready to pick. The first frost for my yard does not usually arrive until the beginning of November, so we will be able to harvest beans from this patch for several weeks. Most gardeners have a pretty good idea of how much their gardening success depends on insect-visitors to the garden that pollinate our garden crops. Without those pollinators, we would have less good food to eat! Learning more about the many kinds of pollinators, how to attract them, and how to protect them, can help us all keep that good food coming into the kitchen. An upcoming Pollinator Symposium, set for September 23 at the Monastery of the Holy Spirit in Conyers, GA, will provide an opportunity for us to learn more. I am on the Monarchs Across Georgia committee that is organizing the symposium, so I will be there, of course. Even though this will not be a veggie-focused event, I am looking forward to learning more and figuring out how to apply the information in my own yard. Speakers include Sonia Altizer, from UGA, on Monarch Butterflies; Nancy Lee Adamson, from the Xerces Society and USDA, on native bees; Kim Bailey, from Milkweed Meadows Farm, on hummingbirds; and Keren Giovengo, UGA Marine Extension, on gardening for pollinators. After the talks, there are additional activities for participants to engage in. Options include butterfly walks on the grounds of the Monastery, led by Phil Delestrez of Georgia Parks and by Father Francis Michael Stiteler of the Monastery; a nature walk led by Robby Astrove, Park Ranger at Davidson-Arabia Mountain Nature Preserve; Monarch butterfly tagging with Monarch Watch; and learning to participate in a citizen science project with Project Monarch Health. Registration is $75 (a lot, I know), and the registration deadline is September 16. The Monastery conference center is not huge, so space is limited. If you are interested in attending, registering soon, through the Monarchs Across Georgia Events page online, would be a good idea. The registration fee includes a box lunch and one-year of membership to the Environmental Education Alliance. The Monastery will have milkweed and other plants-for-pollinators for sale at its Abbey Garden Store. I am looking forward to spending the day learning from experts and hanging out with gardeners and others (foodies, maybe?) who want to do more to support our pollination helpers! My little patch of the heirloom Joanie Beans, planted a couple of weeks ago, has come up. If all goes well, the plants should start providing beans for our meals before the end of September. It is very strange to have spent so long away from the garden and to not have summer crops coming in from the yard. We are visiting the local farmers market for many of our veggies instead, and that is a very good substitute, but I do like to grow some our our own food. In the good-news category, my friend Cheryl has been helping a local farmer, Lynn, at her weekend market booth, for several years, and she gets to take home a box of leftover veggies after the market closes on Sunday. This past Sunday, my friend shared some of those veggies with us, so my dehydrator is full of chopped peppers and sliced tomatoes. Thank you Friend Cheryl and Farmer Lynn! To make sure that at least some of my veggies this fall come from the yard, I already have started a batch of seeds in a tray. I will be starting more this weekend, since seedlings are often eaten by pests, burned up in the hot sun, or pounded to smithereens in summer storms, which makes growing some extra a good idea, but I am happy to have made the start. In the first tray, there are a few each of kale, winter radishes, mini bok choy, beets, and collards, and a short row of green bunching onions. The next tray will have more of the above, plus lettuces. I won't start the spinach until in September, because it is so finicky about hot weather. 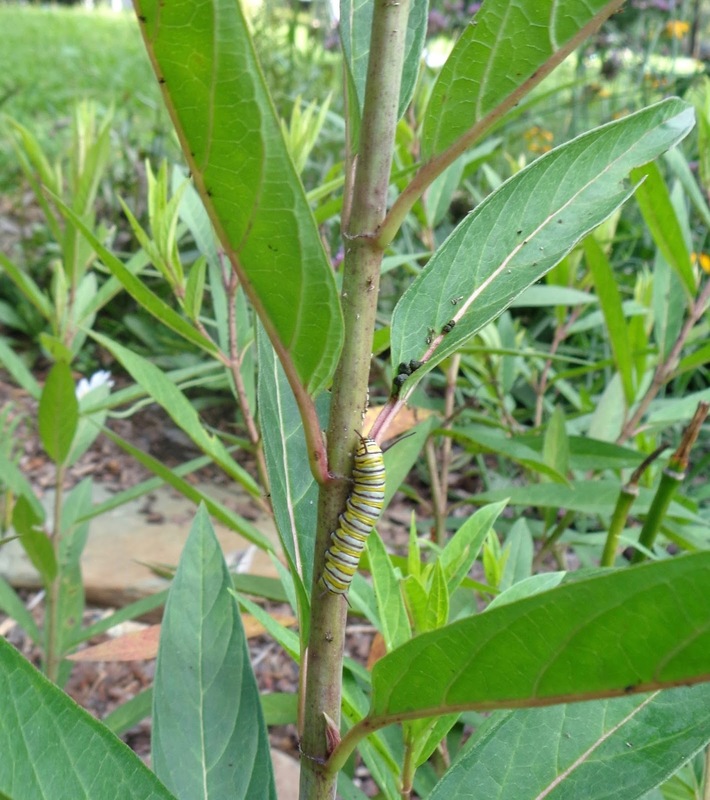 More good news - my milkweed is doing exactly what I hoped it would do: host some monarch butterfly caterpillars. Of course, there are also a bunch of weird orange aphids and milkweed bugs, but the caterpillars were the goal, and they are there.